Meadowbrook Linden Homes! I Got Mine! A White crystal Meadowbrook Chandelier - Great For Those High Ceilings! Well I’ve just moved in and by the look of things so has the rest of the Second Life! The modern Meadowbrook Linden Home seems to be the most popular, plus the houses are nicely designed with lots of light. And, they have more space (slightly…) than the other areas like the elf, fantasy and the disappointing Japanese area. I got told off for moaning about the lack of space around the houses by my friend Danny reminding me that they were ‘free’. I had to gently remind him that these houses weren’t actually free as we have to pay for them through our premium accounts! Anyway I have been very busy this week designing new low prim, bespoke, furniture just for the Meadowbrook house. 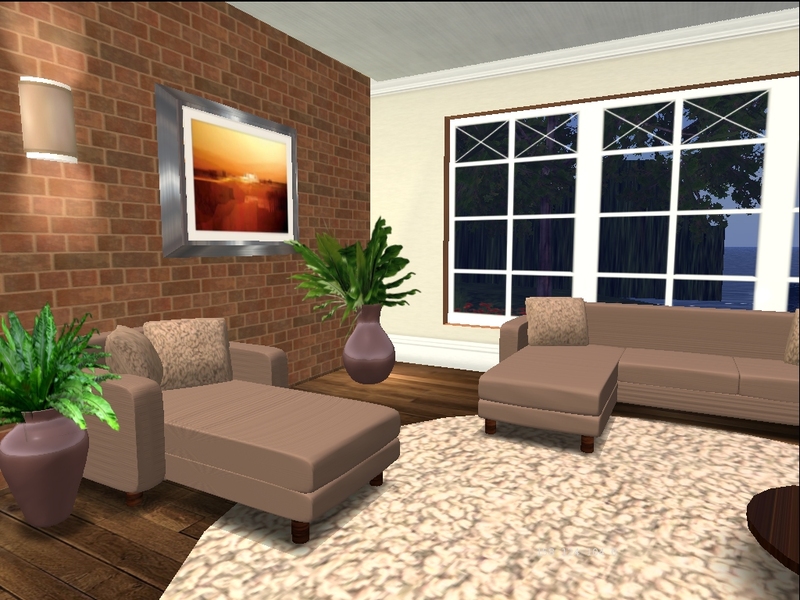 Of course the furniture could be used in any SL home and would probably look good in urban lofts and skyboxes. You can see my Meadowbrook show house (check out my picks and classifieds) and the new styles can be bought in my stores. I have a busy time ahead creating new designs….I just hope my prim allowance holds out! This bed in white and steel has small lights at each corner creating 4 columns of soft blue/white light. Multiple use, make your furniture work for you. If you have copy/ modify permissions then you can save space and prims by creating a light out of an existing piece of furniture. For example, some of our prints and paintings are modifiable and just one or two prims. If you turn it into a light as well, that won’t affect the picture but may help to light up a gloomy corner without the need to get another lamp. When you select the light option, leave the SL default settings as is, it’s easier if you’re not sure what you’re doing and the default settings work well anyway. What you could change though is the colour of the light as this can create really different moods! For example I’ve used a turquoise light which works really well with white. Lighting is everything in SL and makes such a difference to how things look and react. If you can get a few low prim lamps and use strategically to light up your home. Try to go for lamps with different light settings (Hi,Lo etc). Don’t worry if you have to move your lamps around a bit to get the right effect as light works differently in SL than RL. For example, in SL several lights next to each other or even lights which are behind a nearby wall may cancel each other out. So get some great lighting and experiment! Lastly, get a signature piece of furniture or art or photography. I visited a house where the owner had bought an amazing huge clock which really helped to create the tone for the house. A lot of people are also using particle effects to fill up space and create some amazing artwork and all of course really low prim. I really hope you enjoy your new place, now that you have that one place to call your own, somewhere to get changed (that isn’t a public mall), somewhere to invite your mates over without the threat of the security booting you off. And hopefully we will see you in store soon, have a look at more pictures of my new range and let me know what you think! For those who want extra heat another fire for your home. Thanks Gualetar…I don’t know why the text isn’t clear that’s strange. Which post in particular was blurred? Previous Previous post: Congratulations Giselle & Tiany!